In this somewhat surreal Victorian trade card, or something similar, a bird, perhaps a wild turkey, meets a rabbit (or hare) walking upright on its hind legs down an inpaved road. Theres a wooden white-painted signpost in the background with a carved human face and grass for hair, a pointing hand, and a bird sitting on it. The turkey (if that’s what it is) in the foreground leans on a cane or walking-stick, has a backpack and wears a top hat with a circular broach fastened to the top of it, has a maltese cross, and round one raised leg an ornament or ball dangles from the ankle. 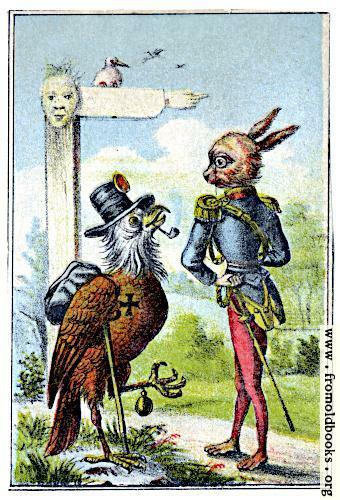 The rabbit wears a monacle, an eighteenth-century miltary officer’s blue top and magenta tights, a sword at the left hip. No, I don’t know what any of it means.